DISCOVER THE SEEDS OF ARTIFACTS! Top Cow launches the "Origins" line of ARTIFACTS trades with one of the stories that led to the event that forever changed the landscape of the Top Cow Universe! 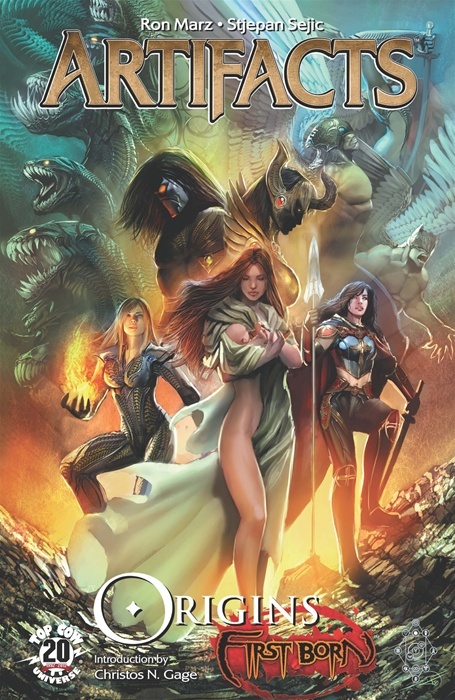 The birth of Sara Pezzini's daughter Hope reignited the dormant war between the Darkness and the Angelus, set the bearer of the Witchblade on the path to "War of the Witchblades" and set the stage for ARTIFACTS. Find out how in this re-branded and expanded trade collection! 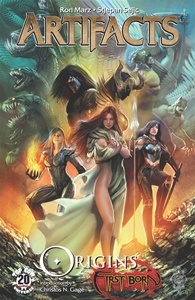 Written by Top Cow Universe architect RON MARZ (WITCHBLADE, MAGDALENA) and featuring art from STJEPAN SEJIC (ARTIFACTS), STEPHEN SADOWSKI (Project Superpowers), LUKE ROSS (Captain America), RICK LEONARDI (Fear Itself) and RYAN SOOK (MAGDALENA, Wednesday Comics) this collections features the complete First Born event! Collects FIRST BORN #1-#3, WITCHBLADE #110-#112 and FIRST BORN: AFTERMATH.